Fans of comic book art UNITE! Coming in February is the inaugural edition of the CAT Price Guide. Artists like Neal Adams, Jack Kirby, and John Romita, Sr. will be featured. Over 30 more artists are also featured, awesome and legendary in their own right. 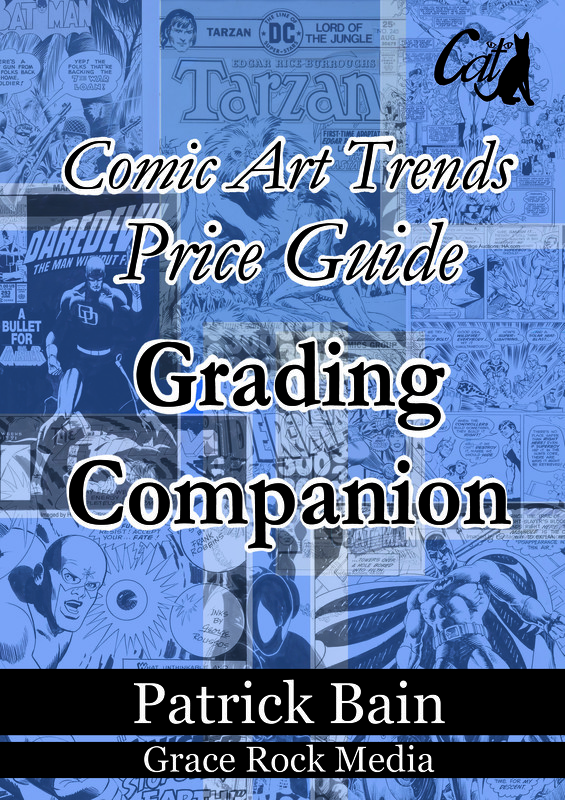 The Comic Art Trends Price Guide is an easy to use reference book to find sales information on some of the most spectacular art to grace the comic book industry. The guide is organized by artists, where each of over thirty legends has his/her own section featuring sales data by title, images from their most significant works, and summary statistics with trend lines to gauge the market going forward. The CAT Price Guide will be entertaining to the comic art geek and relevant to the comic art investor. I believe the information in the Comic Art Trends Price Guide will empower many more people to enter the market for original published comic book art. Download the draft of the Neal Adams chapter for a good representation of the type of information contained in the Comic Art Trends Price Guide! Adams is only one of over thirty industry leading artists in the original art price guide. The Comic Art Trends Price Guide is all about original, published, comic book art. Naturally, it has to have pictures of some of the most fantastic comic art ever produced. Thanks to Heritage Auctions for permission to use their images! Each picture includes basic information such as the name(s) of the artist(s) and a description of the page. I also include info such as price and date sold. Of big value to the reader, I indicate the CAT score for each page. That is the primary means that the reader can learn how to differentiate artwork using the CAT Scale. Hey do you like prizes? Identify the artist and comic book for the partially revealed background. First person with the correct answer gets a small prize and a big feeling of superiority! Send your guesses directly to me. Find my email address on the Contact Us page. Hint: The image is also on another page on this site. Big thanks to Phillip and Fredericksburg Books for jumping in to support the Comic Art Trends Price Guide! I'm adding graphs and summary info to the Jim Aparo chapter of the Comic Art Trends Price Guide 2019. Here is a graph that depicts the average sale price for Aparo pages by year of sale. A 3 Year Moving Average is superimposed over the graph as an aid to viewing the trend of the mean sales price. Moving averages are lagging indicators of the trend. They are not predictive in nature, but they help to balance out the one-time swings caused by outlier sales either on the high or low side. Who ever said "Don't judge a book by its cover...", obviously did not collect comic books! Comic book covers make all the difference in the world. That's why I want to shoot for the stars in selecting a cover artist for the 1st inaugural edition of the Comic Art Trends Price Guide. I want a cover that says, "We're here to stay!" Please check out my crowdfunding campaign for some special incentives to help me in my quest for cover awesomeness for my guide. Come by my exhibitor booth in the lower exhibition hall. My booth will feature an incredible superhero tee-shirt quilt made by my mom... as well as an opportunity to buy a copy of the first edition of the Comics Art Trend Price Guide. Best of all, you will be able to save 20% off the retail price and I might even throw in some freebie. I'm working with Phoenix Fan Fusion event planners on two presentations. The first is an interactive overview of the CAT Scale grading method for original comic art. The second presentation is a fast-paced Jeopardy style game for connoiseurs of original comic art! Copyright 2019 Patrick Bain All Rights Reserved.